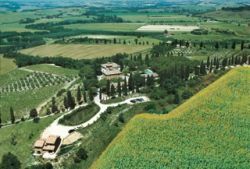 The farmstay Pieve Sprenna is situated halfway between the city of Siena and the Orcia Valley. There are 10 holiday apartments of different size and 8 double rooms with bathroom, as well as a restaurant using mainly farm and local products for their dishes. Pieve Sprenna is an antique possession of a Tuscan noble family, lying in the midst of the hills around Siena. The center of the farmstay is formed by an antique farmhouse with watchtower dating back to the late Middle Ages. Inside there are 9 apartments and 6 double rooms, of which one room on the top of the antique watch tower. The other two apartments and rooms are situated in the annexe building, that once was the old farm barn. The farmhouse is surrounded by a huge park with pinewood and swimming pool that has three different water levels, a whirlpool area and small waterfalls as well there is a small lake with ducks and other courtyard animals. You may enjoy the sun lying around the swimming pool in comfortable sunbeds or the fresh shadow underneath the pine trees. While you are relaxing in the sun, your kids may play on the plaground with swings, slides, ping pong, boccia etc. all to be reached in approximately half an hour by car. Florence and San Gimignano as well as the Chianti Classico area can be reached in approximately one hour by car. 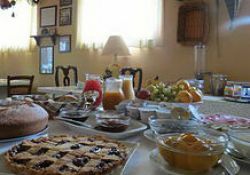 If you desire the "sweet doing nothing", you may start the day with a rich breakfast buffet - during the summer months and during the winter months inside of the farm restaurant - with pies, fresh seasonal fruits, juice, milk, coffee, cereals, yoghurt etc. For lunch you may choose one of the several offered snacks and for dinner there is a daily fixed menu made of starter, first and second course with side dish, dessert, water, wine and espresso. It is a typical local cuisine made of soups, roasted meat, game and desserts that are accompanied by the Pieve Sprenna wine. Taste the specialities prepared by the owners in a charming family atmoshpere. 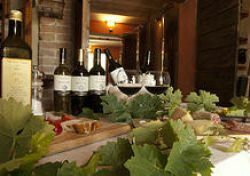 On the 10 hectares of farmland, Pieve Sprenna produces extravergin olive oil, two types of red wine and one white wine. Olives are hand-picked and later on pressed in the oil mill. The Pieve Sprenna olive oil is available in several sizes: in bottles of 0.5 l and 1 l as well as a can of 5 l.
The two red wines are produced with Sangiovese grapes, obtaining the Arrigo VII, a young red wine and Alto Arrigo, an aged red wine, refined for 16months in oak barriques. Donna Mea is the name of the Pieve Sprenna white wine.